Belisarius Arjona gets bored easily. A homo quantus, he’s able to enter a savant trance to access the quantum computing parts of his brain, giving him the ability (and undeniable urge) to understand the patterns of the universe, the mathematical why behind how everything works. His kind were designed by a banking group, determined to create people who could see where the markets would go. He’s as close to a mentat as we’ll ever get. Uninterested in financial markets, and even less interested in the mostly naval gazing of his peers, Bel keeps himself busy doing easy things that keep his mind distracted. Easy things like confidence schemes. He might be known as “the magician” in crime circles, but even he thinks his new con job is ridiculous: he’s been hired to get twelve warships through a public and very expensive wormhole. Even if he can get the first ship through, by the time the rest start coming through the game will be up and the local defenses will be on super high alert. Why did he take this crazy job again? Well, the pay is pretty good, and there’s also that other thing. . . In Ocean’s Eleven style, Bel spends a few chapters collecting his team – meeting up with new resources and recruiting old friends. I felt thrown in the deep end the first 20 pages or so, so those handful of slower chapters where Bel is getting the band together were the perfect way for me to learn about the world, the different genetically modified sub-species of humans that we’ve created, the politics of the situation, and Bel’s place in the world. His art gallery suddenly seems so much creepier. 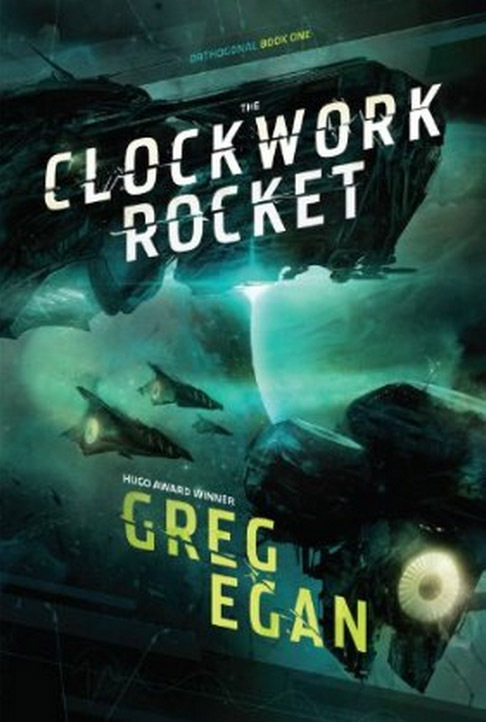 With all the “quantum” being thrown around, I was super nervous that The Quantum Magician was going to read like a Greg Egan, where I couldn’t keep up with the math. Yes, this book is jam packed with physics and biology and quantum mechanics (why didn’t someone tell me before how cool quantum entangled particles are!! ), and zero g maneuvers and adjusting for so many atmospheres and triangulation and the insides of wormholes. Here’s the thing – math is the language of the universe, and if presented correctly, it becomes the poetry of the universe. Künsken made math and physics as fun and as beautiful as I know it can be, he made it into the sweeping architecture of a cathedral. 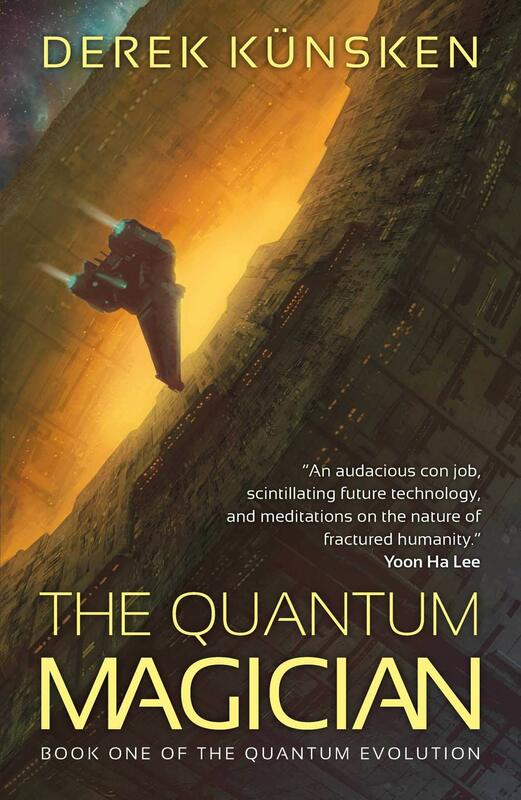 Books like The Quantum Magician are why I love hard science fiction – if the math supports it, anything is possible. Even though sometimes it looks like magic. “The math was comfortingly inescapable”, says Bel. It may be inescapable, but math gives you the blueprints to do anything in the universe. Similarly, the inescapable math tell Belisarius that next time he goes into a deep savant mode known as fugue, he won’t be able to come out of it. The need for knowledge will overwhelm his physical need for survival. Stories tell us who we are, but books are the vehicle. Physical books are vehicle, medium, and method, a metaphor unto themselves, they are both particle and wave. 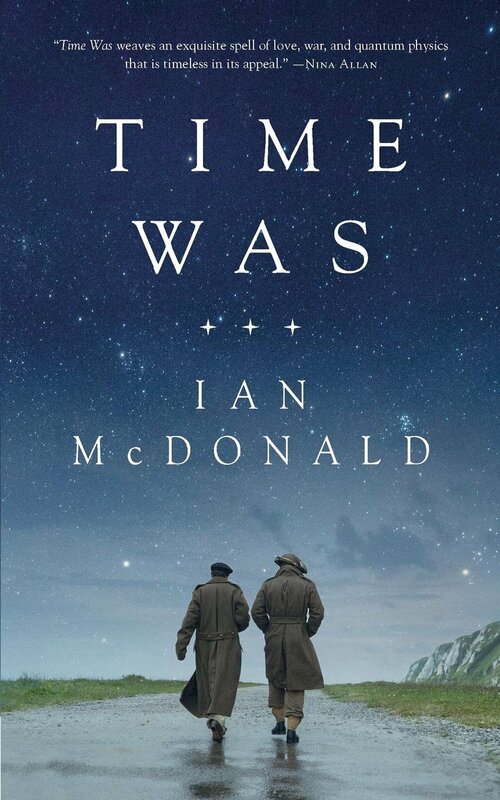 I’ve read Time Was by Ian McDonald twice now, both times started out exactly the same: A quick glance at cover art that communicates nothing, a quick skim of the back cover copy, a quick shrug. A few pages in an immediate annoyance with Emmett, who speaks quickly and with little context, a man who isn’t ready to let anyone in. Then I meet Tom, who I immediately feel protective over as I imagine his quiet smile and puppy-dog eyes. In the moment that Tom’s eyes meet Ben’s, I feel honored just to be in the same room with that beautiful blossoming emotion of their immediate chemistry. When Emmett stumbles upon a battered and slim volume of poetry at the death of a local bookstore, he find a folded and faded love letter inside. Entitled “Time Was”, the book has no copyright date, no publisher information. Used bookstores lucky enough to have a copy appear to be under strict instructions to never sell the book, only to always have it on the shelf. Emmett has grazed the edge of the mystery of Ben and Tom, two men who were forced to discover a means of communicating across time by leaving letters in specific books in specific bookstores. To sully something beautiful, a particular book was their dead drop. But it’s been decades since the war, why are the instructions still being followed to the letter? Whoever is writing Doctor Who these days could do a lot worse than writing an episode based on Time Was. it has places on it. my photo doesn’t do it justice. 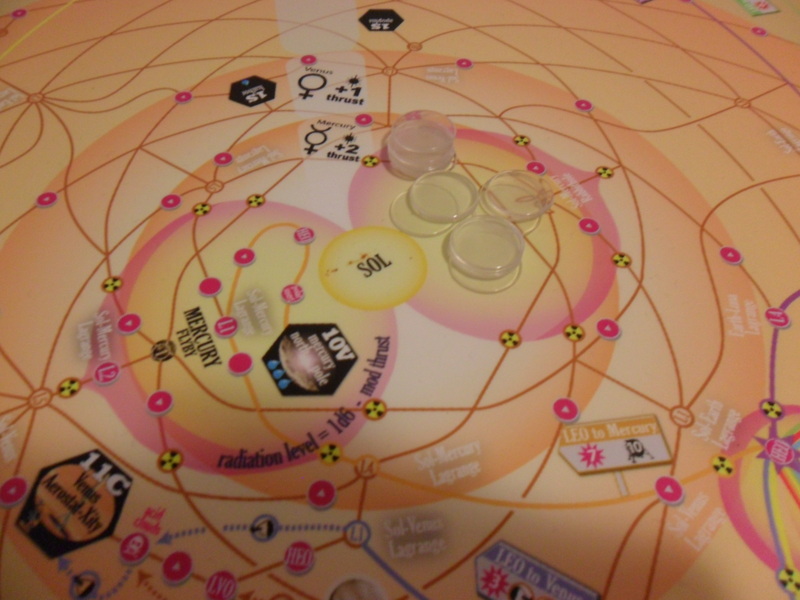 This is seriously the most beautiful game board map I’ve ever seen. 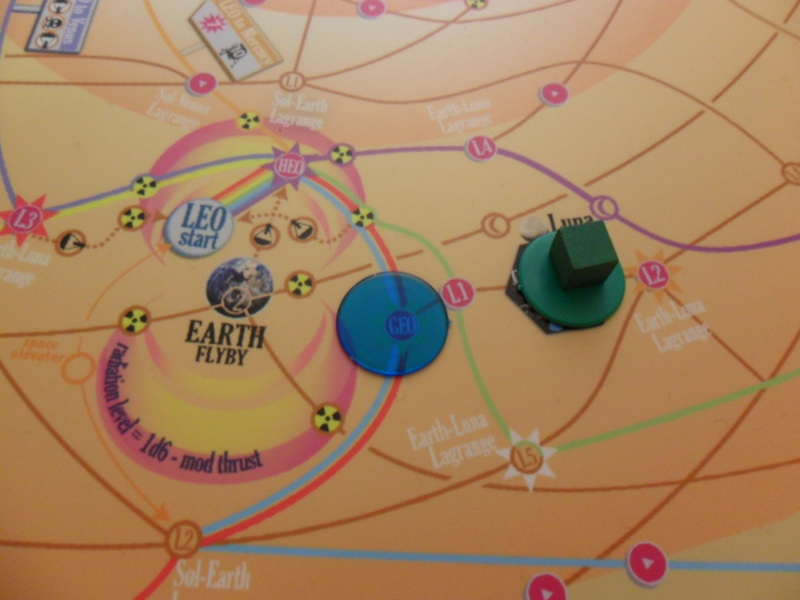 it still has all the things a game board map should have – places, lines between the places, barriers and hazards. 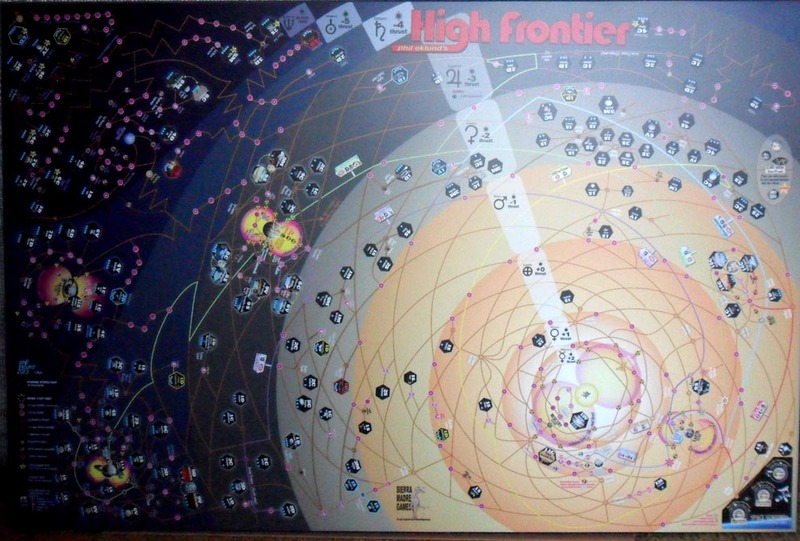 High Frontier is a game about developing technologies to travel to the solar system. Figure out which thrusters or engines and robonaut your ship should have. Take a crew if you want. Water is the only currency. If you take enough resources you can build a factory wherever you end up, maybe a colony. But don’t make your ship too heavy, this game uses real physics and the heavier your ship is, the more fuel it needs to escape Earth’s gravity. And yes, there is a solar sail. All the techs in the game are real. Makes you wonder why we’re not already using them. I really don’t want to go to Mercury. Everyone starts on Earth. Once your mission is ready to go, you can boost your components in Low Earth Orbit (LEO), and then High Eccentric Orbit (HEO), and the Geosynchronous Earth Orbit (GEO). Each of these movements costs you burns of fuel, cuz we’re using real physics. those “L” spots are Lagrange points, where it doesn’t cost you any fuel to change direction. you can just fly right through them and be on your way! A great way to learn how the game works is getting a crew to the moon, and then getting your crew home alive. You’ll learn how your different ship components work, and how much fuel it costs you to move around. I was never a very good formal student. Sure, I always liked school, and I liked learning and didn’t mind studying, but when it came to math and science it felt like the information was going in one ear and out the other. The learning of those subjects never felt like a conversation, it never felt like an interaction. It just felt like work. The greatest teachers of whatever they are teaching make it feel like a conversation. They make physics and chemistry and “how things work” feel like you are witnessing something between passion and magic. Their love for the topic makes people want to learn more. If we are lucky, those passionate teachers record their thoughts. I discovered the writings of the famous physicist Richard Feynman when I was in high school, but it would be years before his books made much sense to me. That’s not to say high schoolers shouldn’t read him, they most definitely should, it’s just that the material was beyond me when I was that age. My first book of his was Six Easy Pieces (and yes, I did eventually go on to purchase the follow up Six Not so Easy Pieces). The Six Pieces are the nearly exact dictations of lectures Feynman gave at CalTech in the early 1960’s. Instead of focusing on formulas and so and so’s law of such and such, Feynman uses easy to understand examples and his vibrant personality and pure love of the subject to invite us into his conversation. 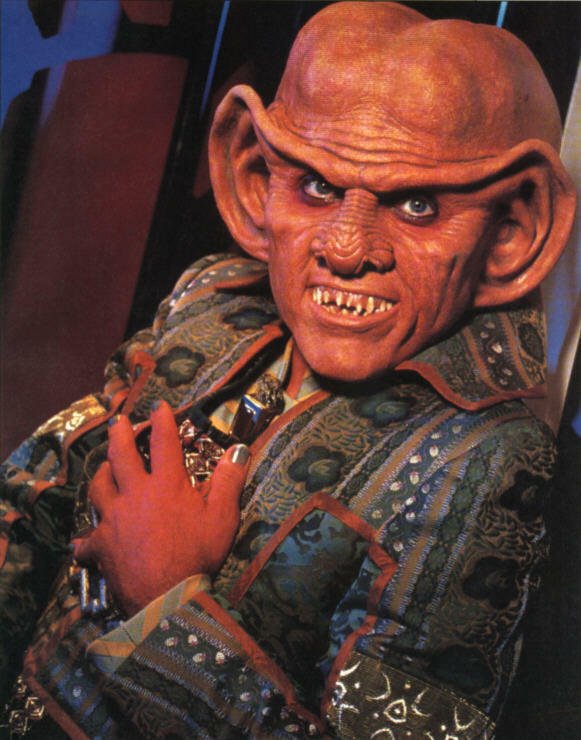 no, the other kind of strange quark! 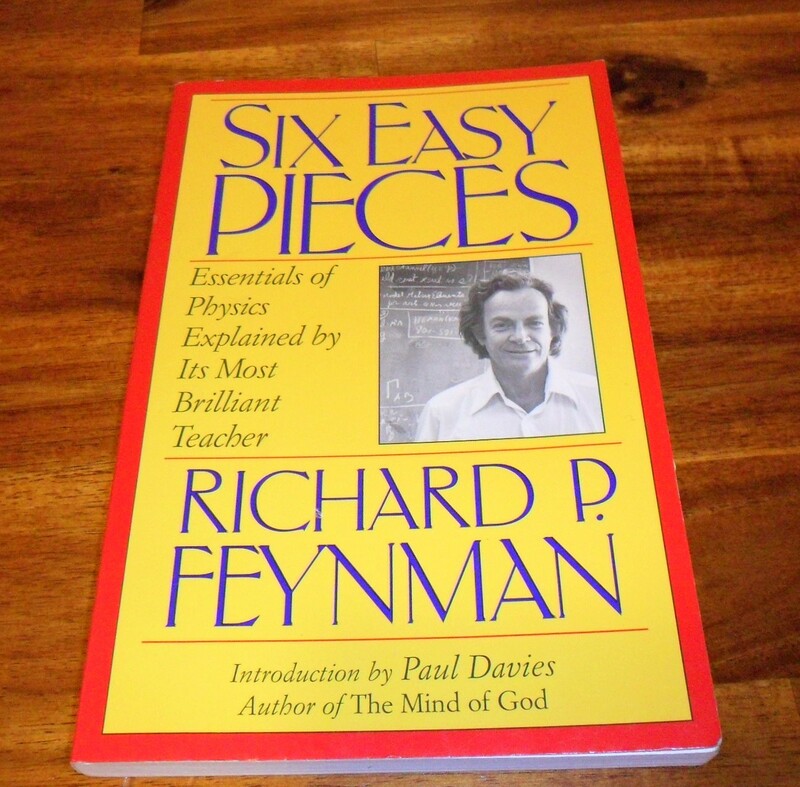 Originally planned as lectures, Feynman breaks down the basics of physics, both classical and quantum in six short chapters. The lectures include stories, improvisations, approximations, and hypothetical conversations on everything from gravitation to strange quarks to perpetual motion and how physics relates to the other sciences. Free of heavy math and scientific jargon, the Laws of Physics are generally compared to learning to play chess by watching two other players, Conservation of Energy is shown through a story about Dennis the Menace hiding his toys (and his mother having to find them), the concept of “partricles with zero mass” is actually explained in a way I could understand, and the chapter on quantum particles starts by describing them as “not like anything you have ever seen”. In that final chapter on quantum physics, Feynman is obviously torn between continually having to refer to the classical “laws of physics”, and confusing the student by having to say “yes, but those laws don’t work here, and now I have to figure out a simple way to show how things really work”. I caught a rerun of a 2008 Mythbusters episode where they debunked the myth that the 1969 Moon landing was faked. I loved the scene where Adam was hopping around in his space suit. Reading Scott Lynch’s Queen of the Iron Sands that features an earthling being thrilled how far she can jump on Mars, because the gravity is lower. Reminiscing about my love for physics and rollercoaster mechanics with a retired physics professor, while discussing many other wonderful things (if he’s reading this, he knows who he is). What do all of those things have in common? they all have to do with gravity and planets and physics and everything that’s fun in the universe! So much science (fictional) fun to be had here! and a little bit of silliness, of course. I suddenly feel like an 8 year old who just discovered an astrophysics encyclopedia! What would roller coasters and bungee jumping be like on the Moon? Maybe we’d need magnets to get the thrill of falling. Speaking of falling, if you were born and raised on a planet with lower gravity, might you never develop a fear of falling? If your planet had two (or more) suns, would you need extra sunblock? Would people grow taller on planets with lower gravity? How many generations would it take for the mutation to “take” in humans? Would plants grow taller? would their roots not go as deep into the ground? How would changes in gravity affect waterfalls and water erosion? How would multiple moons affect ocean tides? How would different gravities affect fashion? Something I read recently (I think it was Anderson’s Bitter Angels), talked about how on a lower gravity planet people used weights in their clothes as fashion accessories, and the poor tied or sewed rocks into the hems of their clothing. What about shoes? What about hair styles? And I don’t know about you, but I’d rather not be wearing a Star Trek Unitard. Sometimes the most important thing is coming up with the questions.